This is the final installment of a four-part series. For the first three, click here, here, or here. I’ve still got a spring in my step. After following Hubbards Lane for a few minutes, I came upon an unusually meaningful destination for the walk: Waggener High School. I never went to Waggener for school. I maybe only knew one or two kids who went there, and I didn’t know any teachers. In fact, the only times I was there was for an SAT exam. Yeah, times: I took the test twice, getting a 1070 the first time and a 1210 the next. Each time I was there, though, I remember thinking, “this is what a high school’s supposed to look like.” Nestled amongst quiet, suburban homes, old, worn building, close hallways, stuffy smell. Those are all the things I saw in movies about what high school was. It’s in those halls where you meet the girl of your dreams, protect your friend from a bully, walk peacefully out of an empty building after some meaningful, life-changing experience. CAL was a brand new building, and I’d watched it get built, more or less, so there was a lack of mystery behind it. Waggener was an old school when I took my tests as a junior, but it was really showing its years now. In high school, the school you attended said a lot about you (whether it actually did was another story), and Waggener had that same feel. Other schools in Louisville have that same, idealized school aesthetic to me: Atherton, Butler, Male, Manual, and Southern all have that same life-building quality in their appearance. I’m not sure I’m describing it quite right, but there it is. Admittedly, a day care is not something you would have seen at CAL. I’d walked around the building to the bus parking lot, near the stadium and practice fields. I could tell it was the bus lot because each of the spaces was marked by long, widely set yellow lines three times the length of a car. I walked to the end of the long lot; several students had gathered in the nearby batting cage to get some early afternoon practice in. Baseball would be along soon enough, I guess. They’d probably already been practicing for weeks. Before grabbing my next road, I looked down, spotting a smashed, empty can of beer and a pack of crushed cigarettes. The vices of high school: they never change. I don’t miss high school as much as I thought I would. It was a critical time in my life, but I don’t long for it in the way I feared I would. When I see high schoolers, I see them for what they are: kids. Sorry, sophomores: you’ve still got a lot of learning to do about life. I know I’m probably not the only twenty-something that’s told you that, either. High school was great for me; I know it wasn’t for a lot of people, but I treasure the time I had there and the friends I made. I’m not that far removed from it yet; I still remember the names and faces of everyone in my class, all 137 of us. In the end, high school really is about the people you meet. The reunion this fall will be fascinating; though we now live in the days of Facebook and instant updates on our old classmates, seeing them face-to-face will be the way we remember who we were, not the way we’ve created in our profiles. 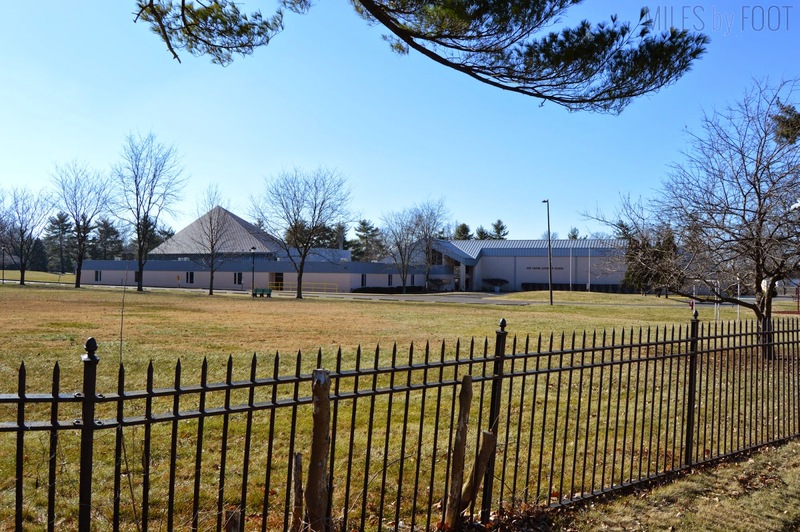 Conveniently, the high school is right up the street from the district’s elementary school. Yeah, that’s an orthodontist’s money that put that fancy sign up. Well played, Perelmuter. A couple of kids were playing basketball in a little side court near to the road when I passed. They continued their game, but every so often, they’d independently look over at me and I’d smile at them. They kept doing that, bewildered with each glance. The houses along this stretch were small, but nice. It was clear that many of these families had lived there for decades, their claim firmly laid on their lawns, gables, and windows. Crunchy brown leaves still covered some lawns, while others had been meticulously raked clean. One even had these funny guys on ‘em. I guess they must be some kind of seed; only one reason a tree wants to drop part of itself, after all. They were very yellow. Maybe I could use them to paint my house? After passing these modest, but well-tended St. Matthews homes, I found myself passing a string of different churches, each from a different denomination and congregation. The second one was particularly curious; it was named Harvey Browne Memorial Presbyterian. In all my life, I’m not sure I’ve seen a church named after a non-canonized person. Seems like God or a saint should be the only name on most church buildings, but this was an anomaly. Although I’m sure a commitment of love by the congregation to a former pastor, community leader or likewise, it still struck me as odd. I couldn’t get over it, passing a third church and finding myself on Shelbyville Road again. 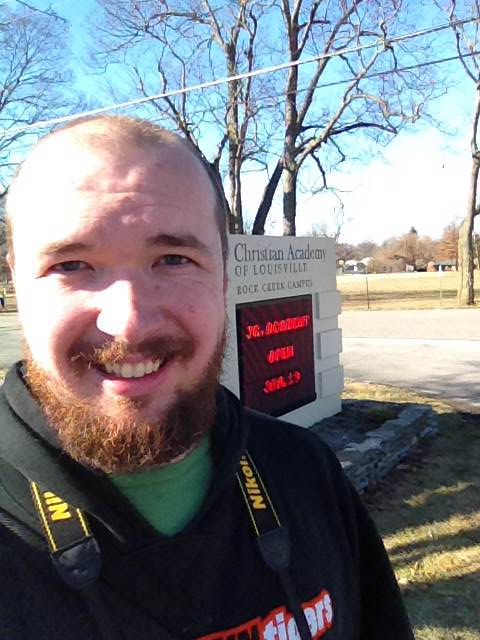 Not a mile from Waggener High, you can find Trinity High School, a prominent Catholic high school for boys. Although I had several friends that went there and considered going there myself, I still think of them in terms of sports first. You see, in Louisville, we can’t get enough sports rivalries. There’s us and Indiana, Kentucky, Cincinnati, Tennessee, Western and Eastern Kentucky; we even sprinkle it into our kids’ education. Trinity is one half of the Trinity/St. Xavier rivalry. St. Xavier, or “St. X” locally, is the other large catholic boys’ high school in town, and both schools field nationally recognized 4A football teams. Every September, they get together in Papa John’s Cardinal Stadium and play their yearly game to a packed house. It was the sporting event of the year for high schoolers of the year, whether you went to watch the game (like me), or to hook up and get drunk and/or high (the cool kids). Parents would come, too, whether or not their kids were playing. I always cheered for Trinity myself. Couldn’t tell you why, really; I guess I just heard of them first. Even if you had no skin in the game, so to speak, you had to pick a side. Before I met Nord’s, blood of my blood, moon of my life, Plehn’s was the best bakery in town. Their donuts, pastries, and cakes were truly unmatched. If you got a cake or desserts for any event, you get Plehn’s or you go to Walmart. It was all the same. Plehn’s still makes a crazy good donut, but proximity to a superior alternative put Plehn’s out of reach most days. Don’t think I didn’t think about going in. I’d earned me some fried dough. But I was about a mile away from my final destination. I couldn’t stop now. If you say “pharmacy” these days, most everyone thinks of the Walgreens/CVS/RiteAid model: a convenient store with snacks, medical supplies and an out-of-date photo processing facility with a pharmacy counter in the back. To see a mom-and-pop pharmacy like this was utterly refreshing. You know that everyone who goes in there has deliberately chosen to keep that store afloat. Good for you, St. Matthews. This is the last major road I’ll cross; from here on, it’s neighborhoods and one long city park. This is the part of town I really consider St. Matthews: small houses, old, lumpy streets with no middle line, naturally bent stop signs and quaint, modest lawns. The first thing of note was indeed a house, but only in appearance. I always love businesses run from a residence building. You know that the people that run it found and chose that place to work; they made it work for them, making compromises and adjudicating the space in the way that suited them best. There’d still be a kitchen of sorts, a stairway that creaked from decades of use, and maybe even a fireplace or two. Who wouldn’t want to work a place that actually did feel like home? Don’t let the modest size of the houses and properties fool you; this is a strikingly expensive part of town. But really, you couldn’t ask for a much better location. 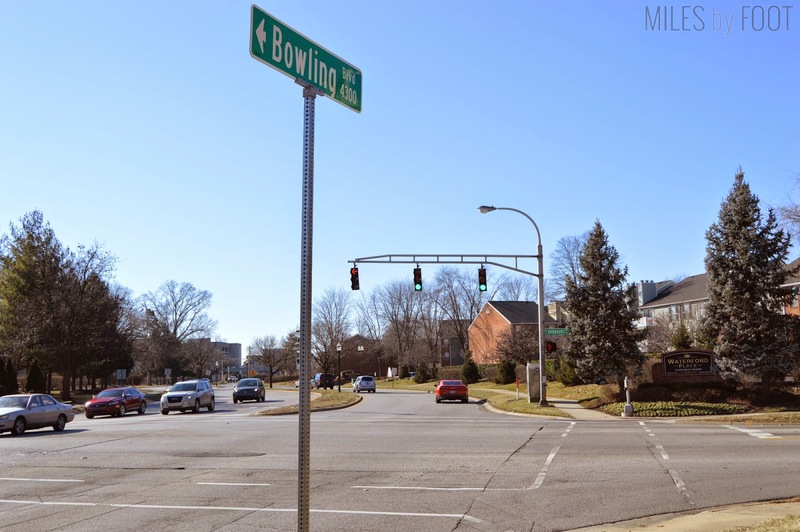 The centralized nature of St. Matthews and its proximity to parks, services, and even the highway are a huge draw for the cities middle and upper-middle class. Beth and I had even thought of living here, but we got to figure out that paper first. What can I say? I really like big, singular trees. Seneca Park; arguably one of my favorite parks in Louisville, I built a lot of memories here from my time at school. It was wide open, flat, and full of fun activities. I still have a lot of dreams that take place here, whether or not they have to do with school. 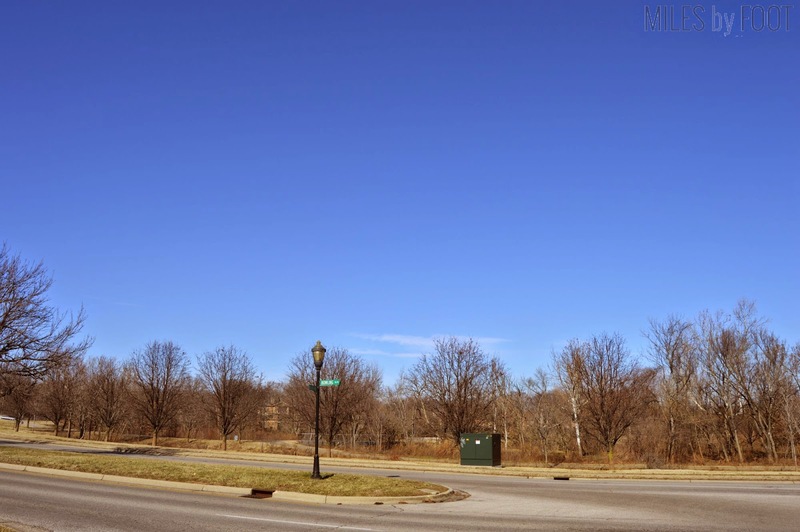 Seneca Park is a pill-shaped park, with rounded corners and a length that reaches about half a mile on one side. A full circuit of the park is about a mile and a quarter, if that gives you some idea of the scale. I hang a left, walk across narrow Cannons Lane, and set foot on the edge of the park. 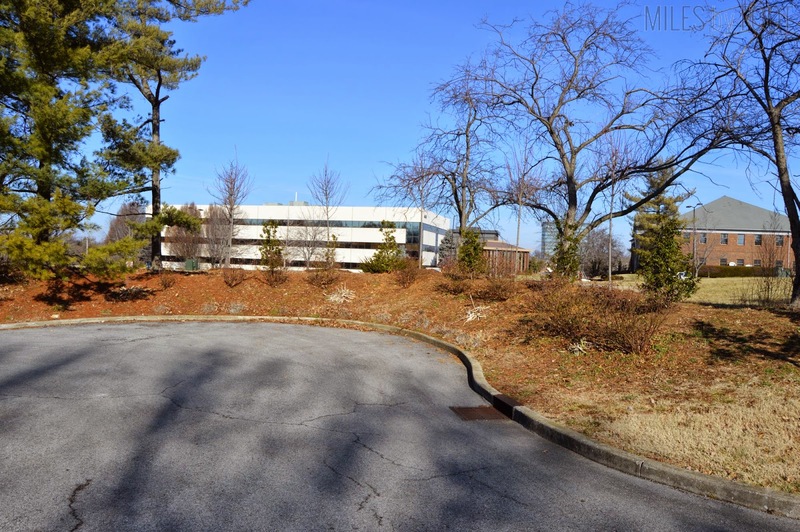 We are really on the home stretch now; Rock Creek Drive is, naturally, the home of CAL’s Rock Creek Campus. Instead of walking along the one-lane road itself, I decided to cross a grove of trees at the corner of the park and follow the walking path that encircles it. I wasn’t the only one out enjoying the day; how often do you get to go for a run in January without a billion layers on? Some kids were even having a fun game of soccer. Soccer was never a sport I excelled at. I’m not a very athletic guy, in truth, but soccer was a particular sore spot for my pride. You see, we’d frequently cross the street from the school and go to Seneca Park for our P.E. class, and occasionally we’d do some organized sports. They had baseball diamonds that we used for kickball, tennis courts, and soccer fields, too. So one day in maybe fourth grade, I’d say, we were playing one half of the class against the other. As you probably remember yourself, P.E. class usually involved the athletic kids getting into it while the less athletic ones kind of passively participated, maybe clustering in groups of friends and just talking, sometimes ignoring when the ball comes their way. I was somewhere in the middle; I wasn’t good enough to get in to the intense athletic portions, running up and down the cord, handling the ball adeptly, so I kind of just waited for the ball to come to me. My time had come. I stopped the ball with my foot, orbited around the stationary ball, lined up, swung my leg straight back like a pendulum and kicked the ball as hard as I could. I was no more than five feet from the goal, but I shanked it, and it rolled out of bounds. The P.E. teacher’s whistle blared, signaling the ball had gone out of play. I got teased for a long time about that one. It was right there and I missed it. Right there! It was then that I realized that soccer was, in fact, not my game. I always think of this story when I walk through Seneca; not the great fun we had playing endless hours of capture the flag (a game I was a bit better at), and even when we threw Frisbee for the first time (which I was very good at thanks to years of tossing it back and forth with Dad). I still love to throw the ol’ disc around. 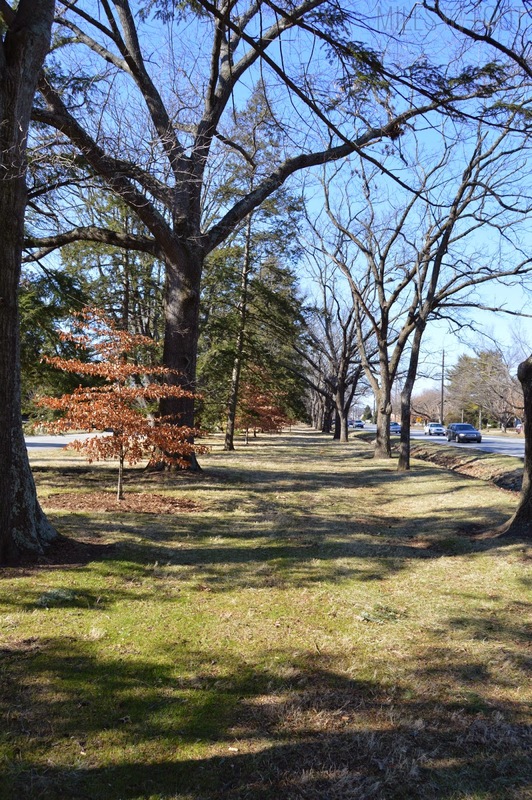 The Rock Creek Campus is about halfway along the length of Seneca Park, perhaps 60% of its length, if you want to get technical. Before that, though, was the Rock Creek Riding Club. I was never a member, and I’ve never been inside or anything, but the riding club still holds a significant memory for me. Because it neighbored the campus, I passed it every day. Lots of times, the horses were out, grazing, foaling, or doing whatever it is horses do when they’re not being ridden or trained. I was familiar with it even though I’d never done anything with it. My main memory of the place comes from third grade. Back then, the school hosted a reading sleepover (I think they might have called it a “readover,” in fact) where you would come to the school’s gymnasium on Friday night, bring your sleeping bag, books, and snacks and you’d read for as long as you could stay awake. Fun, right? Well, I thought it was. I went one Friday night, my Where’s Waldo sleeping back and bag of books in tow. That night in particular, I remember I’d brought The Red Badge of Courage from the Great Illustrated Classics series. They were abridged classics with pictures sprinkled throughout, and I actually believe I was reading this one for a second time. The hundred or so kids and faculty crowded around the door and looked out. The riding club’s barn next door was completely engulfed in bright hot flames, casting a weird, orange pallor on the otherwise dim trees and fences nearby. It was a big fire. You could smell the smoke and, as I recall, feel a bit of the heat when it flared up, even though it was a thousand feet away. The faculty scrambled, calling 911. Third graders love horses, so many broke out in wailing and tears, afraid that there were horses inside. One of the parents of a fellow classmate, took charge, calming kids down while the teachers called the fire department. Minutes later, they came roaring down Rock Creek Drive, but it took a long time before the fire was out. In doing some research to corroborate my nineteen-year-old testimony, it turns out seventeen horses died, but no human was injured. The newspaper article I found even mentioned Mr. Marshall, as I would have known him, as a key witness and helper. It appears that, since then, they’ve long rebuilt, but when I left this campus in 1998, it was still a scorched husk, and it would be several years before the barn was rebuilt and the club would recover. Now, it seems, the barn is bigger than ever. That was one of my most distinct memories of elementary school, and I’ll never forget it. Not counting this morning, it'd been a long time since I'd seen this campus. 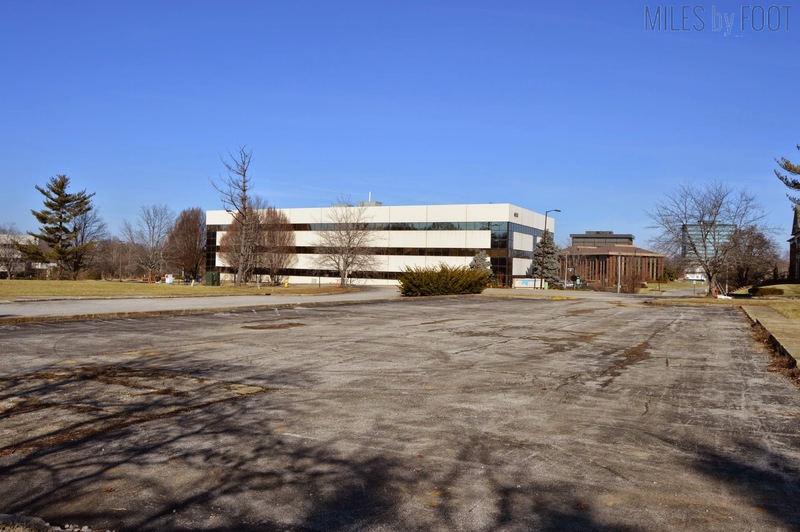 They'd remodeled it since I left, and the office building had been expanded significantly. That part I didn't recognize at all. The rest, though, felt a lot like it did when I was a kid. This part looked different, though not for the reason you might think. 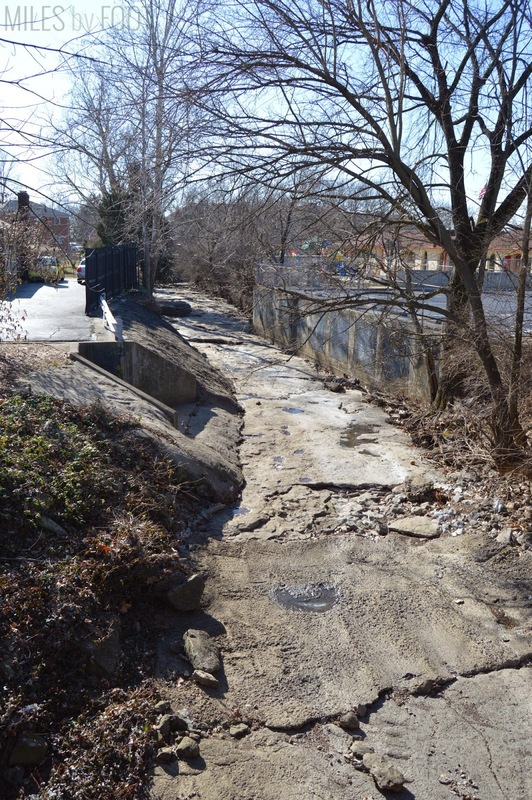 You see, Rock Creek had outgrown itself years before we moved. To combat the huge growth CAL saw in the mid-90s, we were put in "portables," which were effectively double-wide trailers built outside the more permanent campus. It looks like they just took them out recently, as the indentations in the ground signify. Maybe a year or two ago. I spent every year of my elementary in a glorified trailer, but I still built the foundation for my youth there. Many generations of kids after me would do the same. It looks like they redid the exterior of the gym (it and much of the campus was blue and white when I was younger, but it looks the same. The green awning was also new. It was time for a sit. In my time here, this was a computer lab, or at least this building is on the site of the former computer lab, as I'm pretty sure it was closer to the sidewalk and older-looking. For most of my elementary years, I was taught by Mrs. Lampton, an octogenarian with a near-sadistic passion for teaching kids to type without looking. We'd type out "asdf" and "jkl;" endlessly, and on good days, we'd play "Oregon Trail" off a big floppy disk. No, not even a 3.5" diskette with the sliding metal tab, the old thin ones with the film in the middle that would make a terrible racket if you ejected them early. We were rocking Apple IIe's a decade after they went out of vogue. Those were the days, man. On the other side of the gym sat the courtyard, which led to the cafeteria. Classes along the courtyard were for high schoolers. Weird to think, actually, that someone who graduated from CAL as a high schooler the year I started attending kindergarten there would be celebrating their 40th birthday this year. Anyway, I had a lot of memories in thie courtyard, and none of them particularly pleasant. The first one's a long story, but it involved showing my dad the soda a friend of mine liked by pressing the button on a vending machine that someone had just put money in, and along the corridor to the left, one of my best friends punched me in the gut for making an annoying sound. We still called it "the Annex" when I was there, but the building on the right was built to hold additional class space long before I started going there. I never had classes in there, but a lot of the "legacy" teachers did. The teachers' lounge was in there, and it was actually pretty neat; it was lined with books like a little library with a really, really high ceiling. The art room was in there, though; I cut my hand open when our art teacher had the bright idea to let fourth graders carve linoleum tiles with an X-acto knife. I had so many good memories here, though. I look a lot different than when I left, but it's all part of the journey. After just shy of six hours of walking, I’d finally crossed the finish line. What was originally intended as a 17 mile walk, according to the map, expanded into just over nineteen miles, with all my stops, exploration, and deviations. This was my longest single walk to date, beating St. Louis, the Falls of the Ohio, and my original walk. 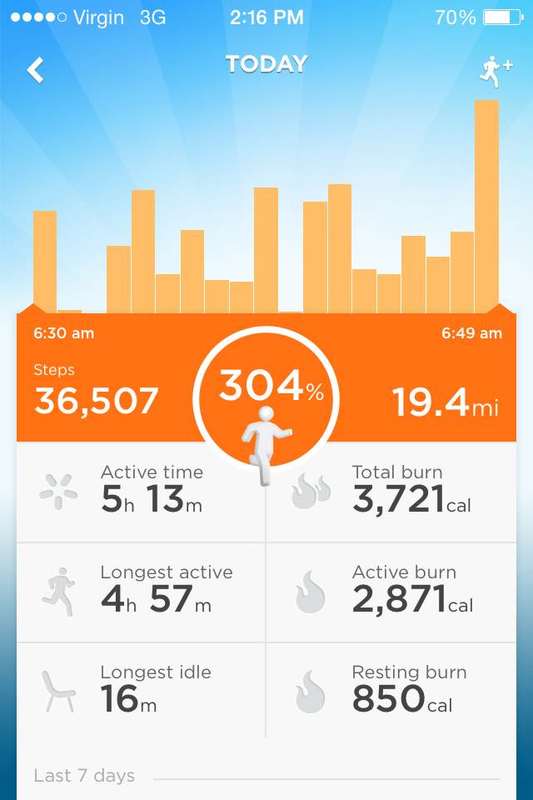 Thirty-six thousand steps later, I could have actually kept going. There she was, my kind chariot and (thankfully) still there, despite being parked on semi-private property for six hours. I got inside and just relaxed for a minute; I had accomplished one of my original walks, and it let me reminisce on the relationship I had with school, the city, and my own history. Twenty-seven might be pretty young to be retrospective, and I used to be even more nostalgic than I am. Thus, it’s interesting to see all of these familiar places not only with new eyes, but from a new angle: on foot. The important thing to remember is that these events are important and valuable, but they were events. What the future holds is much more exciting. So where am I headed for April’s posts? Why, I’m heading up to the Windy City! Chicago will be my next target, and I’m following the St. Louis model: fly out early in the morning, complete the walk, and fly back the same day. I’ve got three airports to walk through (two of which I’m not terribly familiar with in-person), a lake shore to walk, skyscrapers to behold, and a whole lot more that I can’t predict. But that’s OK; I don’t want to predict everything. To see a city honestly, you have to experience it up close, uncensored and intimate. Thank you for joining me for this particularly personal walk, and I hope you’ll follow the blog to stay on top of each month’s walk. Was school important to you? What would it look like to walk through your own home town, tracing the invisible line that geographically ties your schools together? This is the third part of this journey. For part one, click here, and for part two, click here. 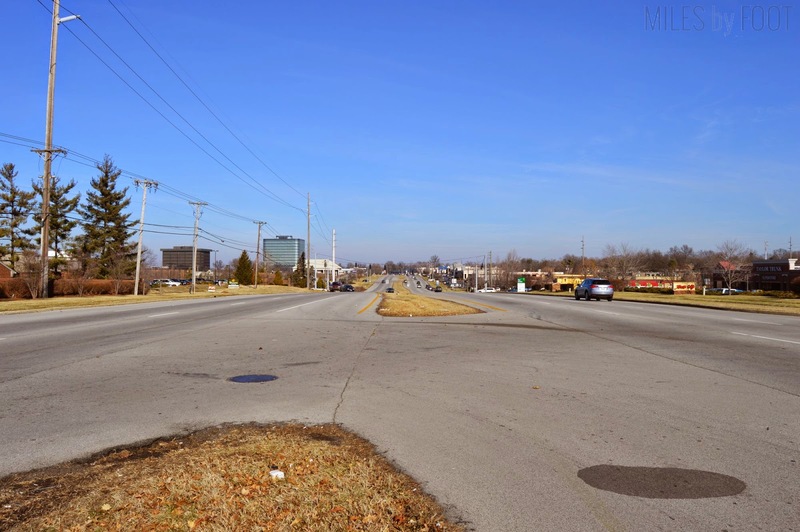 Hurstbourne Lane, at one time or another, has been called the busiest surface street in Kentucky. It’s in competition with another road in southern Lexington which, when I’ve been on it, has earned its reputation well as a logjam of stoplights, university traffic, and invisible turn signals. 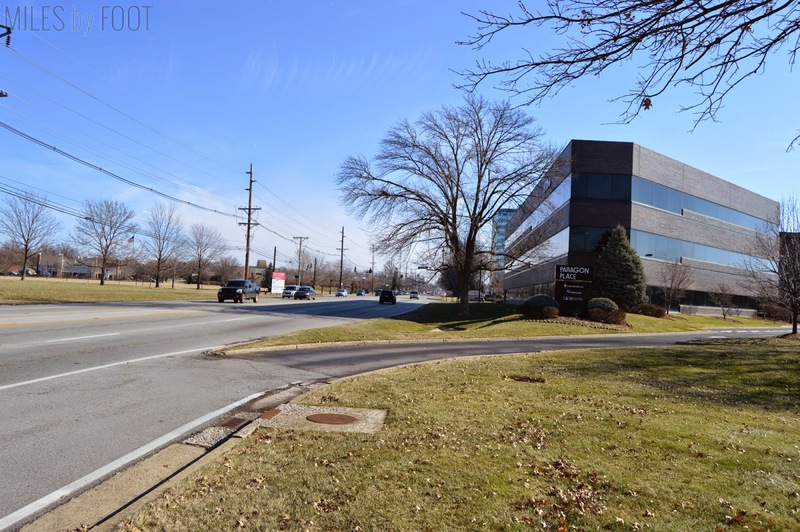 Hurstbourne is much wider, but it’s still the main drag for this part of town, leading to everything to strip malls, grocery stores, large subdivisions, and endless office parks. Today, though, it was quiet enough I could cross and snap a shot. Just twenty steps to the middle, then twenty to the other side. This side street, technically. 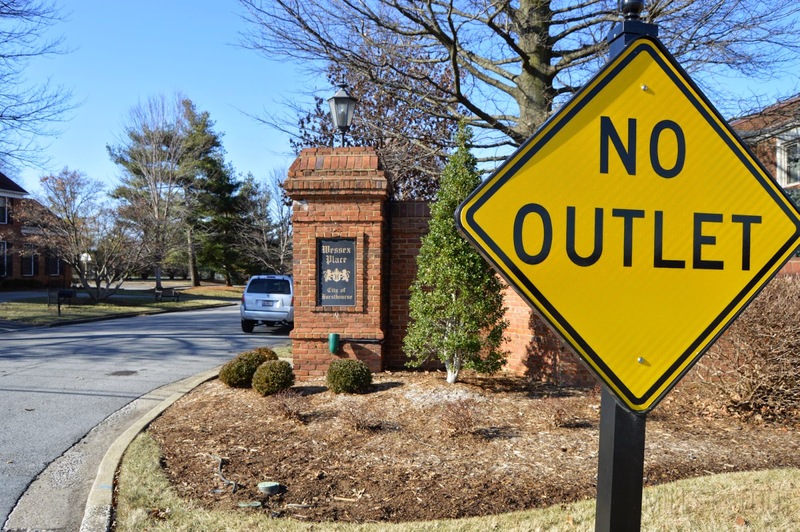 is a no outlet street. The joy of being on foot, though, means that you can go where a motorized vehicle can't, so I'm actually planning to shave off a bit by defying the sign. Let's test it. The road was lined with well-manicured lawns and several large homes, but soon, these plots gave way to closely-bound townhouses. On either side, these townhouses generally bore the college flag they preferred. For those of you outside of Kentucky, college ball is a huge deal here. Because we don't have any pro teams in Kentucky, we latch on to our admittedly very successful college ball teams instead. The red, flapping cardinal head indicated University of Louisville (we call them U of L), and the blue University of Kentucky flags bear the two letters used to identify them (UK, never U of K, for some reason.) There was about an even split of 'em. Myself, I was a UK fan all through going up (like my dad), but became a U of L fan when I stated going there myself (who my mother cheers for.) My sister doesn't care, so we pretty perfectly represent the Kentuckian sports gamut. Under a house that hailed no public allegiance, I saw this little sheepdog (?) guy batting at the plate glass door. This little fellow was batting at the door, causing the plate glass to wobble with each swipe. He seemed to be calling out, too, but I couldn't hear him. Or her, I guess. That admittedly sounded much more ominous then I intended; I'm sure little Fluffy is just fine. "End of the line, everybody off!" A cloister of quiet office buildings rested alongside the prefab homes. 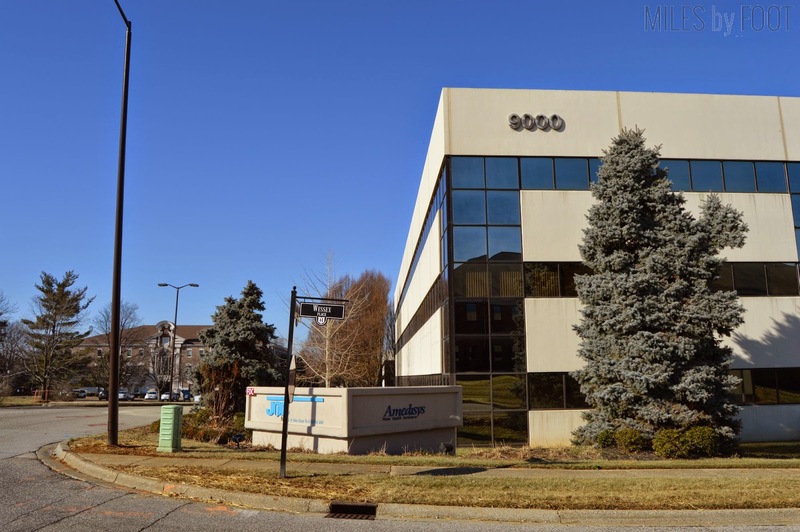 Amedisys, one of this building's tenants, isn't a company I've heard of, but the home health services space is a popular one. Before I got my full-time position out of college, I interviewed at such a place. Their small, well-differentiated and, well, uninteresting to must 22-year-olds. 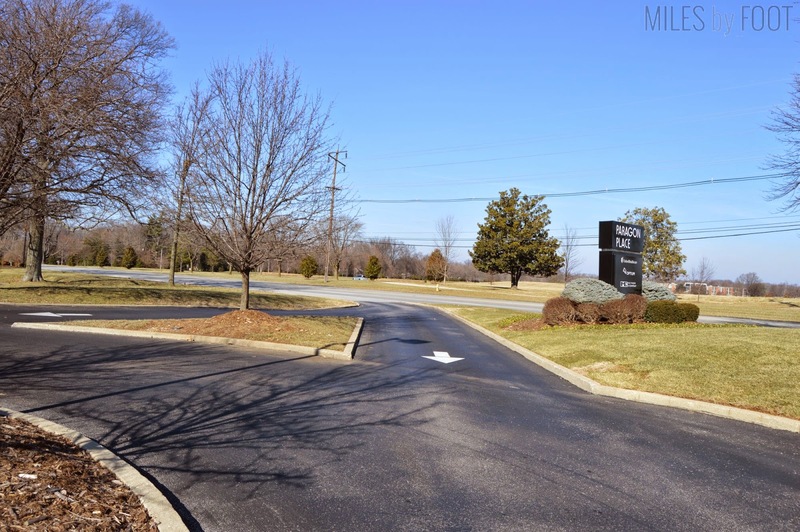 A quick turn at the end of the drive put me on Whittington Parkway, which circles around to meet Shelbyville Road, the East End's main drag, the one I bypassed. Turns out if you want to cross between the East End and anywhere close to downtown, this is the most economical way to do it. 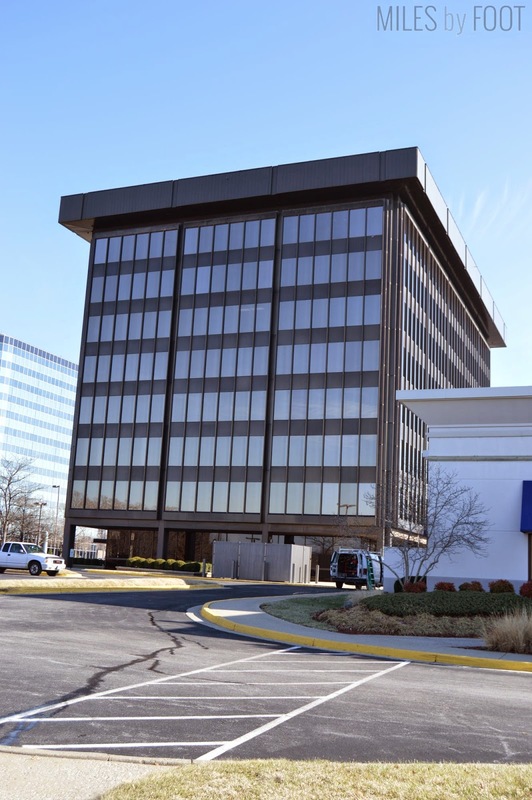 Speaking of old jobs, this was the corporate headquarters for the first place I had full-time employment. I was only ever here once, for my original orientation, and we had a training session across the street once. Most of the time I sat in my cubicle though and punched in and out like any good corporate lackey. ...and here's the building where the temp agency was based where I became the lackey. I passed a typing exam in there; 78 words a minute, and 75 was the minimum. Didn’t know how to use the numpad then, but now I do. 123456789987654321. Isn’t this convenient? I wish my work had an off-ramp directly from the main drag; I’d get to work three minutes faster every day. When you’re considered late after clocking in five minutes late enough times, you’ll know how it feels. And here it is, Shelbyville Road. As US 60, it goes all the way to Virginia Beach, hundreds of miles east of here. 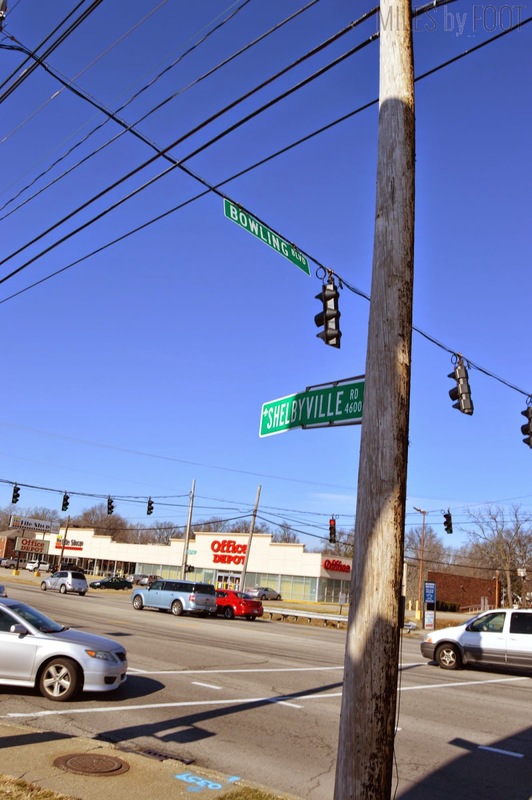 I remember when my dad told me that in my youth, I couldn’t believe that Shelbyville Road (as I saw it), could be that long; it seemed impossible. Now I know that, in theory, roads can stretch for as long as you’ve got land to put ‘em on, and even then, sometimes there’s a tunnel or a bridge to keep it going. The length of Shelbyville Road would be my home for the next hour. As it seems to be with most walks I undertake, there is a particular stretch that is long, unbroken, and necessary to facilitate the journey’s more complex and time-consuming interactions down the road. This marked the halfway mark for me, and the road would carry me for a spell before I hooked a left. Seems like I’m not the only one to walk this way. Benches and sidewalk furnishing are something you never notice while you roar down the road. 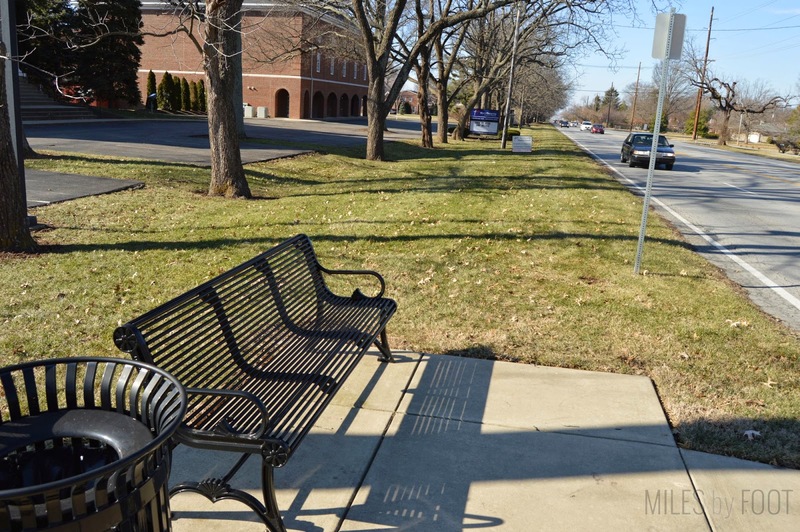 Even though I’ve driven Shelbyville probably a thousand times, I could never have told you there was a bench here, or frankly, that there was even a sidewalk there. After a good eight or nine miles on my feet, I was tempted to stop, but I knew that the sit at the finish line would be all the more rewarding. Hurstbourne Baptist Church, up ahead on my left, is a bizarre bit of architecture. Unlike traditional churches, it’s build in the style of the Doge’s Palace in Venice, with its prominent arcade area that surrounds the main, square building. It looks totally different externally, with different colors, patterns, and about a six-century age difference. Still, when I first saw a picture of the Doge’s Palace as a kid (admittedly in a video game,) I recognized the homage the next time I rode by. And, appropriately, there’s a gate on the other side. 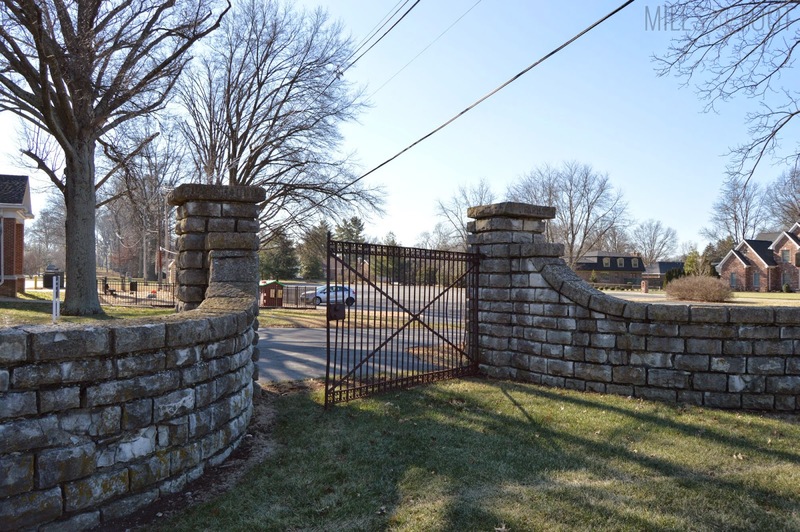 As the gate doesn’t have a road leading up to it, I might venture a guess that it is the original “Hurstbourne” estate entrance, built in the 19th century, perhaps. Unadorned and, apparently, undocumented, I took a moment to consider this bit of history. Someone has to know what it’s from or they’d have bulldozed it decades ago. 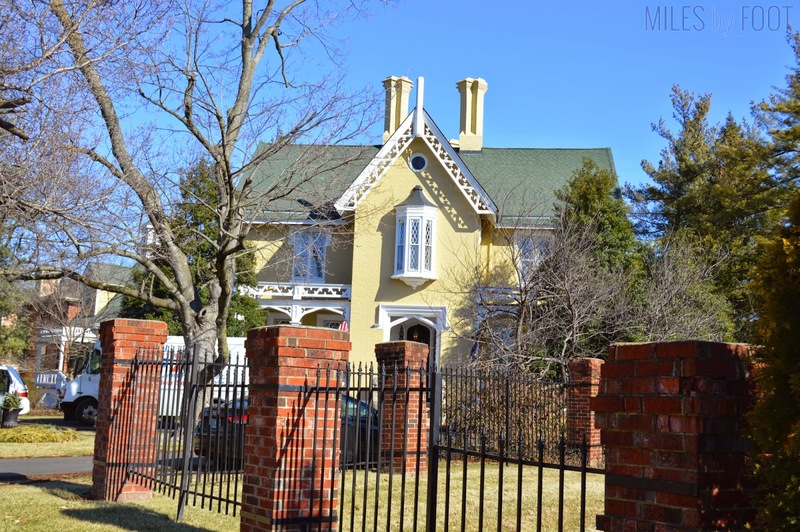 Similarly, this historic house has been left abandoned alongside its enigmatic gated twin. 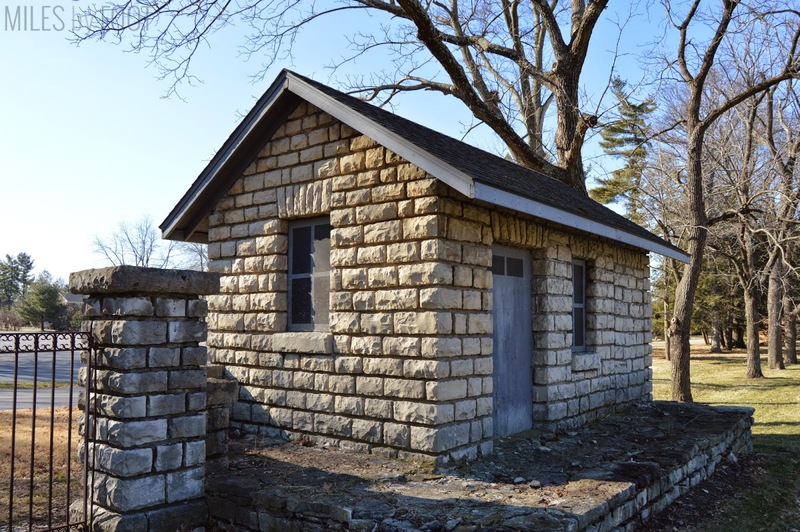 This simple stone house might have been anything from a guard post to a residence, or maybe both. The door and window are painted plywood, propped into the empty frames as shoddy barriers against the decades of elemental torrent and breeze. Thus, my heart was disappointed; no way to look inside, and far too high-traffic to just, well, barge in. Guess I’ll have to just keep wondering. I never realized how big Shelbyville Road is. This stretch of the U.S. Route is flanked on either side by lines of bald trees, drainage ditches and recessed homes and a smattering of small, boutique-style businesses. Because there’s rarely any reason to go to this particular part as your destination, it’s easy to tune it out. If you can believe it, though, I do have one significant memory on this stretch of otherwise nondescript and mundane bit of road. Over twenty years ago, we were driving down this way in my parents’ 1986 gray Pontiac Bonneville. I was in the back, picking at the stickers I had stuck to the window, and the radio said that Richard Nixon had died. Both my parents reacted sharply to the news. I was six, and I knew he was a former President, but that was about it. Every picture I’d seen of him he was pretty young. I don’t remember the conversation that followed, but I’ll always remember where I was when I had it. After making wobbly and ankle-threatening steps on the pulverized asphalt edges of the road, I decided to abandon the roadside walk and made for the soft, earthen path that paralleled it. The soil was squishy, likely from the frost or a recent rain. The earth made an audible sound when I stepped on it; it reminded me of when I was New Zealand. On a particularly long-distance walk in the South Island, we walked through some very old forest, undisturbed for eons. The forest was hard at work decomposing its former denizens, both plant and animal. Thus, the earth was very loamy and spongy, but it wasn’t springy. It stole your steps when you walked in it, and the ground was covered in feathery moss. Truly a sight to see, or a step to take, at least. This wooded path continued for perhaps a quarter-mile before I was forced to switch back to the roadside. 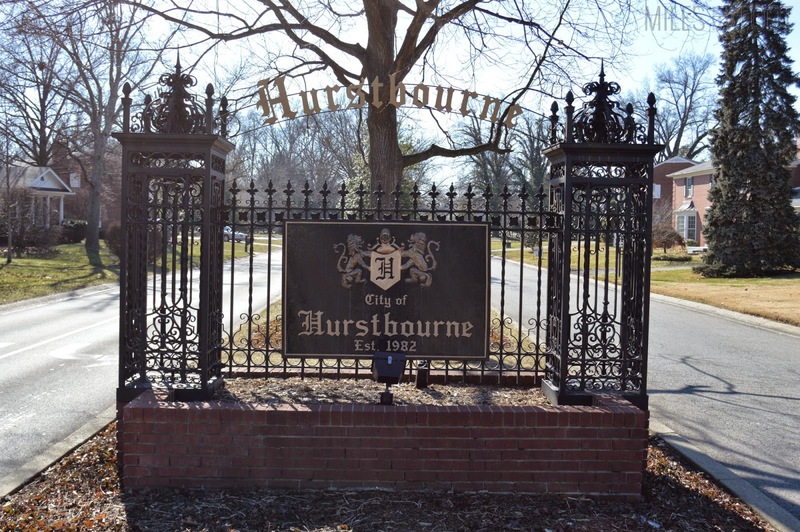 Traditionally, I’m nearly certain that Hurstbourne was a vast estate, and the land was sold to developers perhaps forty or fifty years ago, judging by the sign and the ages of the houses within. This would have been on the edge of town in the 1960’s, but now it is firmly suburban Louisville. Our Savior Lutheran is both a school and a church. When I was growing up, the kids who went to Our Savior Lutheran were unanimously labeled as “weird.” The one girl I knew who went there was our neighbor’s granddaughter, and she used to come over and play with my sister. In fact, I provided that introduction. Her grandfather wandered across into our property when I was nine or ten years old, shooting basketball at my newly installed goal. He asked if she could play with me, and we did for a while before my parents came out to see that I’d made a new friend. When her grandfather explained, she was brought inside for something to drink, and she, Lil and I became friends. We didn’t have too much in common, but we got along fine. My most distinct memory of her involved a friendly wrestling match that went wrong, her pinning me to the ground firmly with her skill and, well, heft. I was a pretty scrawny fifth-grader, but that was embarrassing. That’s what I think when I look at Our Savior Lutheran: an eight-year old pinning my chest to the floor in my parents’ upstairs hallway. Not sure that’s the connection they’d pick. 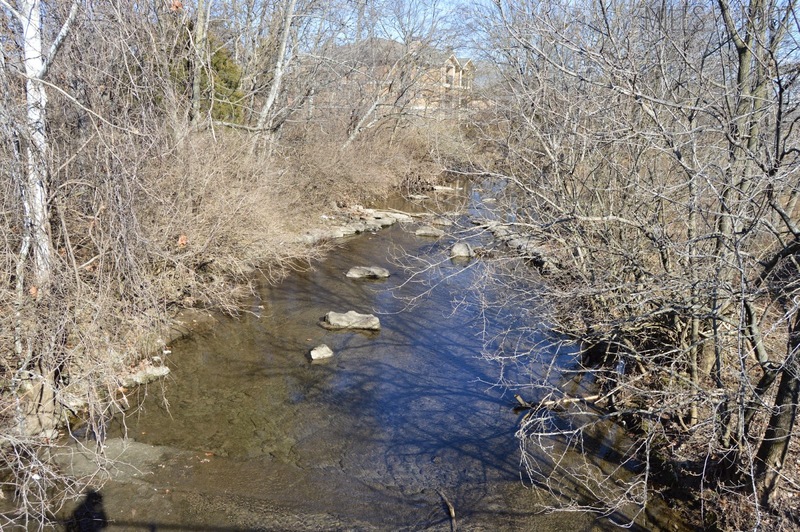 To see a truly barren storm creek is unusual; combined with the low precipitation level and the fact that it had been very cold the last few days meant that the local creek didn’t have a drop to drain away. 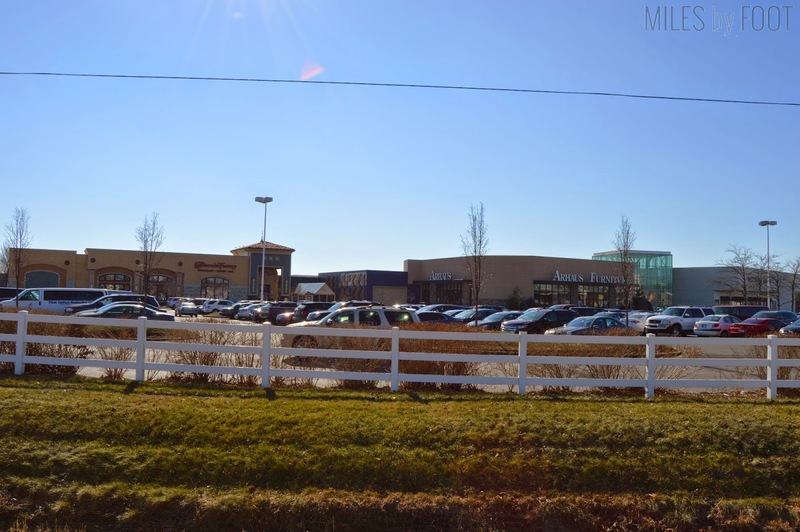 Suddenly, the roadside opened up and I was in a veritable expanse of shopping outlets and parking lots. 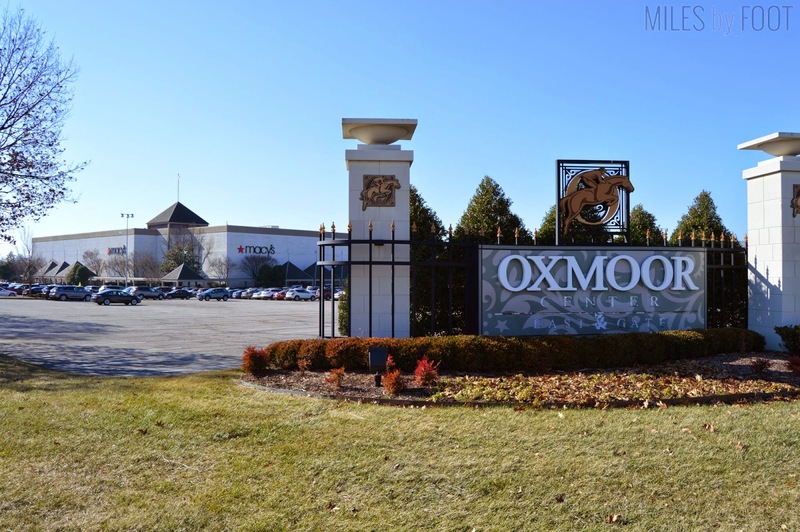 Oxmoor Mall, as we called it, is a fixture in most East Enders’ youths. 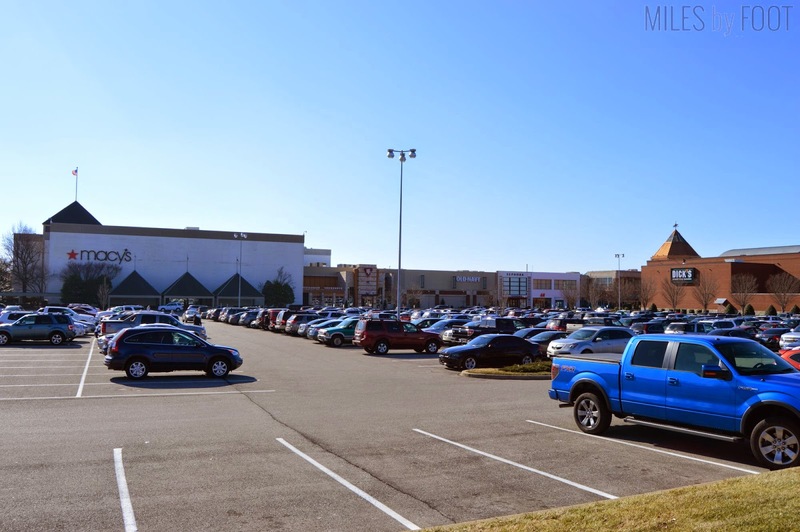 Choosing between here and the adjacent Mall St. Matthews was a critical turning point for an evening of fun, generally based on what food the food court had, as we were too poor to buy more than one thing in the retail shops. 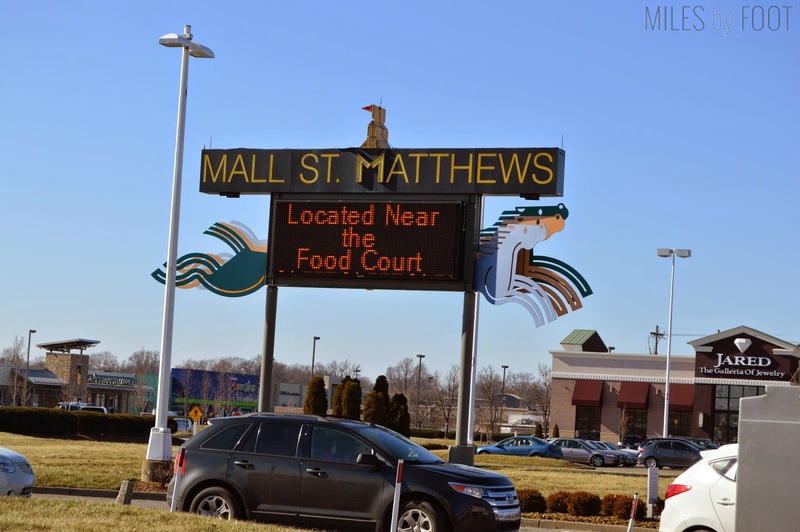 I have to say, I was a Mall St. Matthews kid; I mean, it had my name in it. At a bit after 12:00, it was still too early for it to be packed, but it was a warm Saturday, so by mid-afternoon, it’d be rolling with tweens and their reluctant parent chaperones. 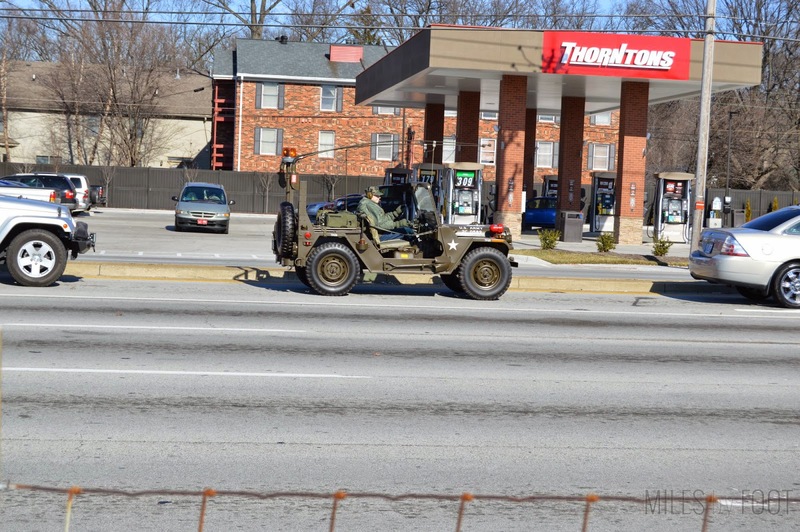 This guy was rockin’ down with the top down; he had some classic rock blaring out of what seemed like a boom box instead of his government issue jeep. The light turned green and he turned, taking his CCR with him. I crossed the intersection, and soon I had run out of shoulder. I either had the option to walk alongside the very narrow shoulder which faced a high-speed interstate off-ramp or walk through a car dealership and hope a small fence. I decided to split the difference, walking along the fence, avoiding the sharp, rusted barbed wire that lined the top of the fence. It snagged my hoodie a couple times, but I kept pressing on. Eventually, I had to cross. I watched the off-ramp traffic for a moment, and it was steady. Nope, still too short. Now it seems – no, I guess I’ll wait another…now! I bolted across the ramp and through the adjacent stoplight, which didn’t have a pedestrian light attached. 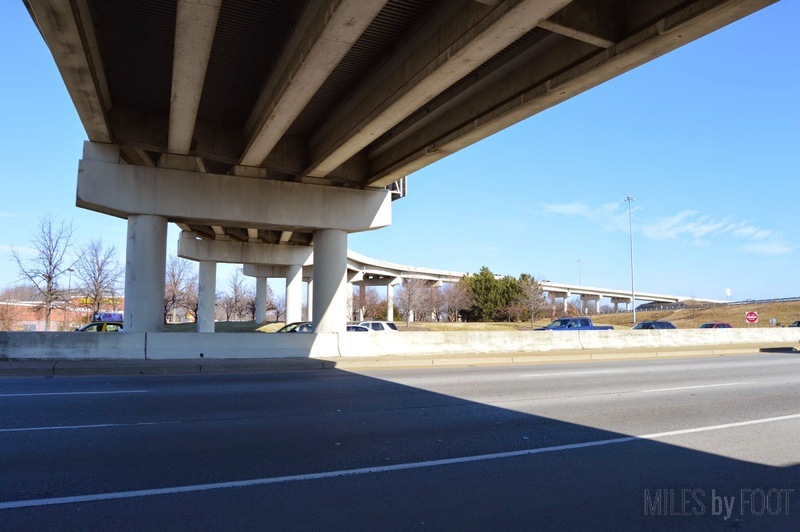 The Watterson Expressway is the inner of our two beltways, and earlier this morning I had crossed over the outer one. The Watterson is a solid ten or twelve lanes here, with places to split off onto I-64 just south of here, and the malls draw significant ramp traffic. 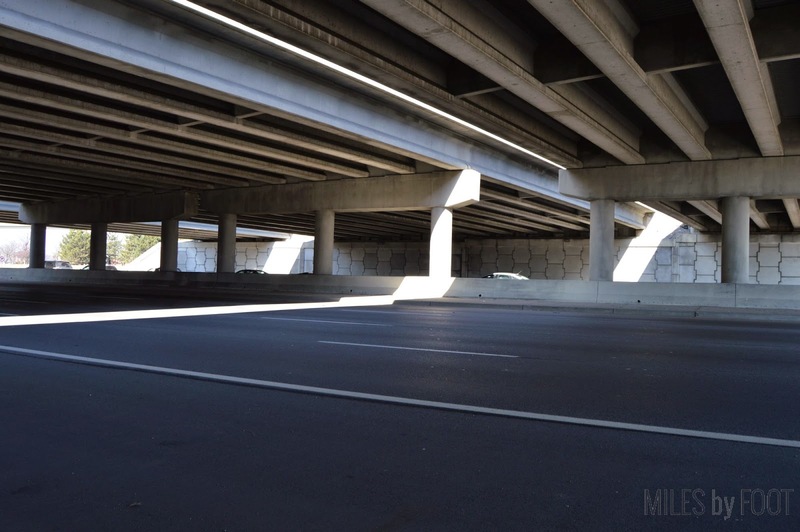 Underneath the roaring interstate, the echoes of cars around you and above you made a weirdly toneless music. If you looked carefully, you could see the overpass quiver as a semi roared by. Normally, walking through the underpass is a quick affair, but as wide as it was, it took a couple minutes to cross. We really forget how big things are when we’re not moving along them at a sprint. 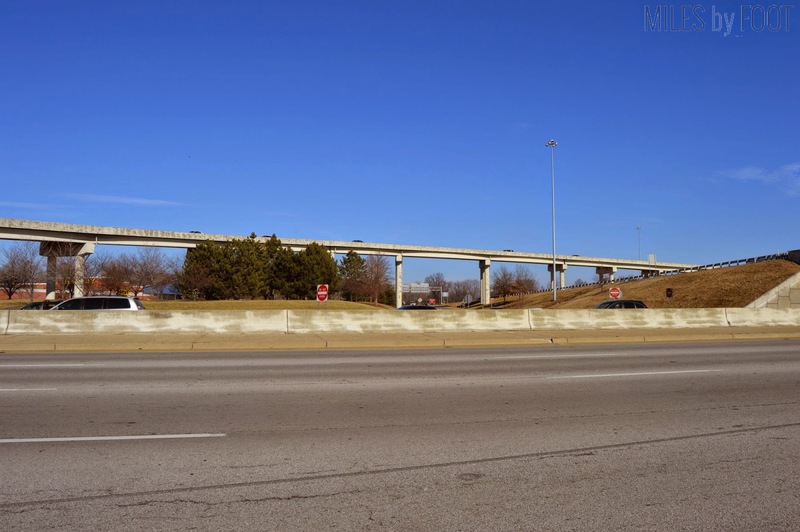 Just the flyover here is probably a full half-mile long, all suspended on concrete pillars that we blindly trust. It takes a lot of planning to make sure it all lines up. Remember when you’d start writing something long on a posterboard in school and you’d crunch up or stretch out the letters to make it look even across the whole thing because you misjudged your letter size? Can’t do that here or you end up with pancake pedestrians. 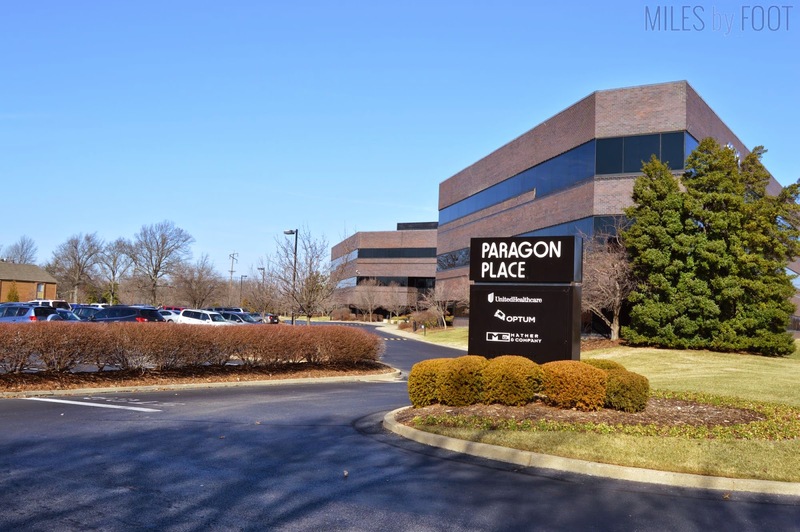 The second mall and my preferred retail venue of the two sits on the west side of the Watterson. We recently got a Cheesecake Factory (OK, maybe eight years ago, now,) which happens to be one of my parents’ preferred Sunday dinner locations. The first one I ate at was in Kansas City ten years ago. As a senior in high school, the fancy pillars and bright colors made it feel like a palace. Now it’s just a place to pay 8.99 for a slice of cheesecake when Sara Lee will do. The Jared jewelry store down the street was offering free chai tea as a goodwill promotion for their store. It was admittedly a weird request for me; I was pretty cool, and I was very thirsty, but I was also in extended exercise and never like to drink hot things if I’m exercising (who doesn’t?) I politely declined, assuming the two kind ladies who offered it to me had no idea the drink conundrum they’d spawned in me. I crossed a side street, a Whole Foods, a Taco Bell and a Frisch’s Big Boy. As I walked by their parking lot, I saw a woman getting into her car with some food. But you see, she’d left her drink on top. 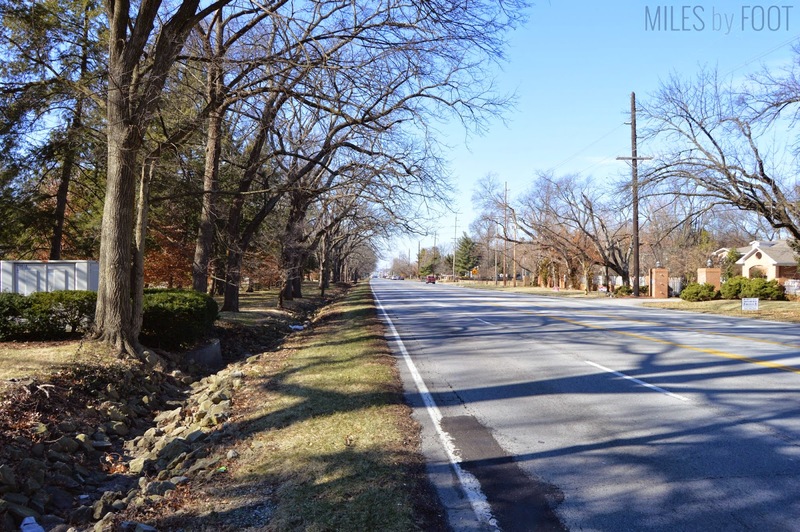 She pulled back and as I reached out to tell her, the Styrofoam cup tumbled off into Shelbyville Road, splattering sugary soda all over the pavement with a pop. After exactly one hour on Shelbyville, it was time to hook a right, my final destination just a few miles away. I crossed to the western side of the street and walked down that way. I was passing a pretty new strip mall that had expanded from its humble beginnings as a Hawley-Cooke Bookstore anchor. Hawley-Cooke was one of my favorite places to go when I was a good. It wasn’t video games, but it was close; lots of colorful books with places, animals, and comics, too! In my youth I loved Garfield comics, so going to a bookstore was exciting, as I’d get to see which book had come out since the last time I was there. Hawley-Cooke’s been closed for ten years; the whole complex that housed it, formerly a “C” shape with the Hawley-Cooke at the center, got cut into an “I” and “S” shape, with squiggles of strip mall shops and boutiques on either side. Borders even tried to capitalize on their former location, and we all know how well that went for ‘em. Bowling Boulevard is a long drag. 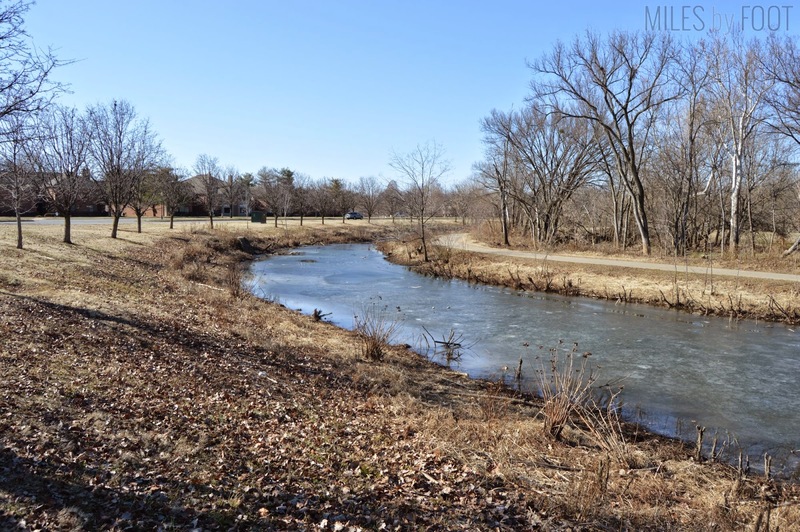 I was on it half a mile before I saw anything interesting, besides a bank of luxury car dealers on the other side of the street: Beargrass Creek. I actually see bits of Beargrass everywhere in Louisville; the little-creek-that-could wiggles all over the eastern part of the city. Pretty sure I’ve even mentioned it on here before. 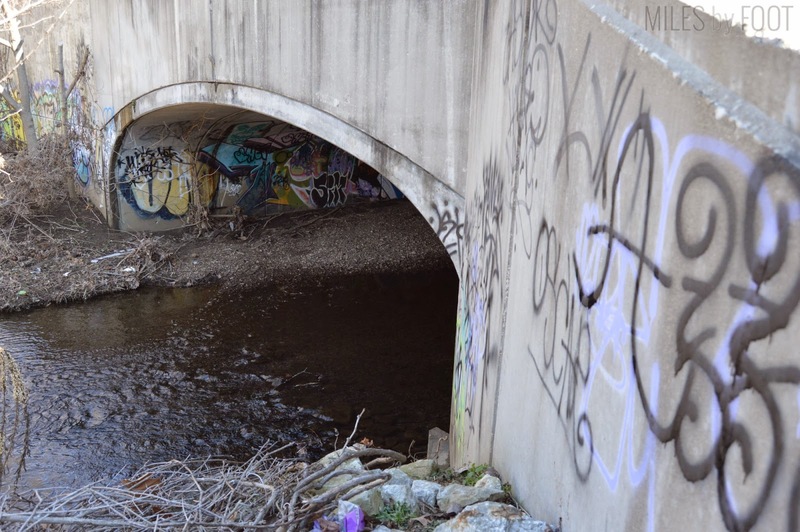 Bridge arches over creeks is a great place to find detailed graffiti. Because it’s relatively easy to access, but very hidden from view, lots of artists come out and make their marks here. The creek itself was thawing, and large chunks of ice still floated around in it, despite the mid-50s ambient temperature. It takes large amounts of water a long time to freeze; logically, it takes a long time to thaw. On my very first walk, I took a very similar picture. It was August, overcast, and hot, but it’s always funny to slalom past a place you’ve touched before on foot, even if it’s just in passing. I followed Bowling to where I met my next road, Hubbards Lane. Browns Lane, which I took at my first walk, terminates at this intersection. Hubbards is its continuation. I’ve actually known several people to live in this area, so it’s pretty familiar to me now. Just as soon as those words were out of my mental mouth, I come across a beautiful building I’d never seen before. How charming! I’ve always loved yellow houses, whether or not they’re in vogue. I don’t know; it’s such a bold decision, I think, to paint your house such a firm, loud color. More power to you! 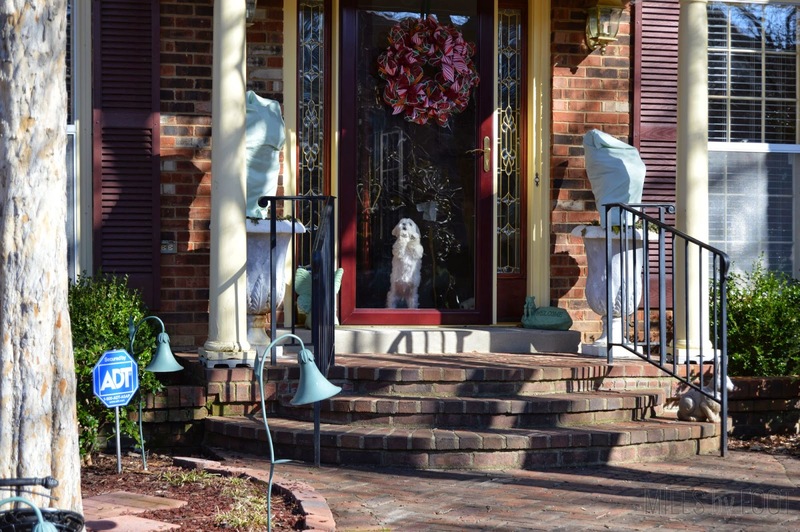 It appeared to be a bed and breakfast of sorts, nestled in the residential area of the decidedly suburban St. Matthews. One happy couple in their thirties was unloading their luggage when I passed by. It’s kind of weird thinking about having to have a place to stay when coming to Louisville. I’ve always had somewhere to go, so that’s a truly foreign experience for me. Even for folks who come home to Louisville, if no one they love calls it home anymore, it’s just another city. I checked my notes. Three miles to my final destination, and it was just past one. One last push! The final installment will post later this week. Thanks for hanging in there!